Mature adults have a pair of small fins projecting from the lateral sides of the mantle. These fins serve as the adult's primary means of propulsion: vampire squid move through the water by flapping their fins. Their beak-like jaws are white. Within the webbing are two pouches wherein the tactile velar filaments are concealed. The filaments are analogous to a true squid's tentacles, extending well past the arms; but differ in origin, and represent the pair that was lost by the ancestral octopus. The vampire squid is an extreme example of a deep sea cephalopod, thought to reside at aphotic (lightless) depths from 600 to 900 metres (2,000 to 3,000 ft) or more. Within this region of the world's oceans is a discrete habitat known as the oxygen minimum zone. Within the zone, the saturation of oxygen is too low to support aerobic metabolism in most complex organisms. Nonetheless, the vampire squid is able to live and breathe normally in the minimum zone at oxygen saturations as low as 3%, an ability that few other animals possess. To cope with life in the suffocating depths, vampire squids have developed several interesting adaptations. Of all deep-sea cephalopods, their mass-specific metabolic rate is the lowest. Their blue blood's hemocyanin binds and transports oxygen more efficiently than in other cephalopods, aided by gills with an especially large surface area. The animals have weak musculature, but maintain agility and buoyancy with little effort because of sophisticated statocysts (balancing organs akin to a human's inner ear) and ammonium-rich gelatinous tissues closely matching the density of the surrounding seawater. Like many deep-sea cephalopods, the vampire squid lacks ink sacs. 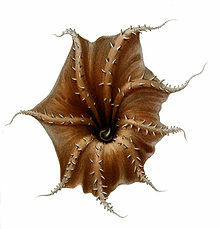 If disturbed, it will curl its arms up outwards and wrap them around its body, turning itself inside-out in a way, exposing spiny projections. If highly agitated, it may eject a sticky cloud of bioluminescent mucus containing innumerable orbs of blue light from the arm tips. This luminous barrage, which may last nearly 10 minutes, would presumably serve to daze would-be predators and allow the vampire squid to disappear into the blackness without the need to swim far. The display is made only if the animal is very agitated because regenerating the mucus is metabolically costly. Few specifics are known regarding the ontogeny of the vampire squid. Their development progresses through three morphologic forms: the very young animals have a single pair of fins, an intermediate form has two pairs, and the mature form again has one. At their earliest and intermediate phases of development, a pair of fins is located near the eyes; as the animal develops, this pair gradually disappears as the other pair develops. As the animals grow and their surface area to volume ratio drops, the fins are resized and repositioned to maximize gait efficiency. Whereas the young propel themselves primarily by jet propulsion, mature adults find flapping their fins to be the most efficient means. This unique ontogeny caused confusion in the past, with the varying forms identified as several species in distinct families. If hypotheses may be drawn from knowledge of other deep-sea cephalopods, the vampire squid likely reproduces slowly by way of a small number of large eggs. Growth is slow, as nutrients are not abundant at depths frequented by the animals. The vastness of their habitat and its sparse population make procreative encounters a fortuitous event. The female may store a male's hydraulically implanted spermatophore (a tapered, cylindrical satchel of sperm) for long periods before she is ready to fertilize her eggs. Once she does, she may need to brood over them for up to 400 days before they hatch. Their reproductive strategy appears to be of the iteroparous type, which is an exception amongst the otherwise semelparous Coleoidea. Hatchlings are about 8 mm in length and are well-developed miniatures of the adults, with some differences. Their arms lack webbing, their eyes are smaller, and their velar filaments are not fully formed. The hatchlings are transparent and survive on a generous internal yolk for an unknown period before they begin to actively feed. The smaller animals frequent much deeper waters, perhaps feeding on marine snow (falling organic detritus). What behavioural data are known have been gleaned from ephemeral encounters with ROVs; animals are often injured during capture, and survive up to two months in aquaria. An artificial environment makes reliable observation of non-defensive behaviour difficult. In May 2014, Monterey Bay Aquarium (California, United States) became the first to ever put this species on display. With their long velar filaments deployed, vampire squids have been observed drifting along in the deep, black ocean currents. If the filaments contact an entity, or if vibrations impinge upon them, the animals investigate with rapid acrobatic movements. They are capable of swimming at speeds equivalent to two body lengths per second, with an acceleration time of five seconds. However, their weak muscles limit stamina considerably. Unlike their relatives living in more hospitable climates, deep-sea cephalopods cannot afford to expend energy in protracted flight. Given their low metabolic rate and the low density of prey at such depths, vampire squids must use innovative predator avoidance tactics to conserve energy. Their aforementioned bioluminescent "fireworks" are combined with the writhing of glowing arms, erratic movements, and escape trajectories, making it difficult for a predator to identify a single target. In a threat response called "pumpkin" or "pineapple" posture, the vampire squid inverts its caped arms back over the body, presenting an ostensibly larger form covered in fearsome-looking though harmless spines (called cirri). The underside of the cape is heavily pigmented, masking most of the body's photophores. The glowing arm tips are clustered together far above the animal's head, diverting attack away from critical areas. If a predator were to bite off an arm tip, the vampire squid can regenerate it. They have eight arms but lack feeding tentacles, and instead use two retractile filaments in order to capture food. They combine the waste with mucus secreted from suckers to form balls of food. They feed on detritus, including the remains of gelatinous zooplankton (such as salps, larvaceans, and medusae jellies) and complete copepods, ostracods, amphipods, and isopods. Vampire squids have been found among the stomach contents of large, deepwater fish, including giant grenadiers, and deep-diving mammals, such as whales and sea lions. Pyritized fossil of Vampyronassa rhodanica from the Lower Callovian of La Voulte-sur-Rhône. The Vampyromorphida are characterized by derived characters such as the possession of photophores and of two velar filaments which are most probably modified arms. It also shares the inclusion of an internal gladius with other coleoids, including squid, and eight webbed arms with cirrate octopods. Vampyroteuthis shares its eight cirrate arms with the Cirrata, in which lateral cirri, or filaments, alternate with the suckers. Vampyroteuthis differs in that suckers are present only on the distal half of the arms while cirri run the entire length. In cirrate octopods suckers and cirri run, alternating, the entire length. Also, a close relationship between Vampyroteuthis and the Jurassic-Cretaceous Loligosepiina is indicated by the similarity of their gladiuses, the internal stiffening structure. However, the inclusion of Vampyronassa rhodanica from the middle Jurassic La Voulte-sur-Rhône of France as a vampyroteuthid turns out to be rather doubtful. The supposed vampyromorphids from the Kimmeridgian-Tithonian (156–146 mya) of Solnhofen, Plesioteuthis prisca, Leptoteuthis gigas, and Trachyteuthis hastiformis, cannot be positively assigned to this group; they are large species (from 35 cm in P. prisca to > 1 m in L. gigas) and show features not found in vampyromorphids, being somewhat similar to the true squids, Teuthida. ^ "Vampire Squid, Vampyroteuthis infernalis". MarineBio.org. ^ Ellis, Richard. "Introducing Vampyroteuthis infernalis, the vampire squid from Hell". The Cephalopod Page. Dr. James B. Wood. Retrieved 27 April 2012. ^ Seibel, Brad. "Vampyroteuthis infernalis, Deep-sea Vampire squid". The Cephalopod Page. Dr. James B. Wood. Retrieved 3 July 2011. ^ a b "Vampire squid from hell eats faeces to survive depths". Retrieved 7 May 2018. ^ Seibel et al. 1999. ^ Stephens & Young 2009. ^ Monterey Bay Aquarium Research Institute (MBARI) (26 September 2012). "What the vampire squid really eats" – via YouTube. ^ Seibel, Thuesen & Childress 1998. ^ Hoving, Henk-Jan T.; Laptikhovsky, Vladimir V.; Robison, Bruce H. (2015). "Vampire squid reproductive strategy is unique among coleoid cephalopods". Current Biology. 25 (8): R322–R323. doi:10.1016/j.cub.2015.02.018. PMID 25898098. ^ KION News (1 May 2014). World's first vampire squid on display at Monterey Bay Aquarium. Retrieved 31 May 2014. ^ Adams, J. (5 May 2014) First ever vampire squid goes on display at the Monterey Bay Aquarium. ReefBuilders. Retrieved 31 May 2014. ^ "Vampire Squid Turns "Inside Out"". National Geographic. February 2010. Retrieved 3 June 2011. ^ Hoving & Robison 2012. ^ Drazen, Jeffrey C; Buckley, Troy W; Hoff, Gerald R (2001). "The feeding habits of slope dwelling macrourid fishes in the eastern North Pacific". Deep-Sea Research Part I: Oceanographic Research Papers. 48 (3): 909–935. Bibcode:2001DSRI...48..909D. doi:10.1016/S0967-0637(00)00058-3. ^ Fischer & Riou 2002. Ellis, Richard (1996). "Introducing Vampyroteuthis infernalis, the vampire squid from Hell". In Knopf, Alfred A. (ed.). The Deep Atlantic: Life, Death, and Exploration in the Abyss. New York. ISBN 978-0-679-43324-8. Retrieved 2007-04-30. Robison, Bruce H.; Reisenbichler, Kim R.; Hunt, James C.; Haddock, Steven H. D. (2003). "Light Production by the Arm Tips of the Deep-Sea Cephalopod Vampyroteuthis infernalis" (PDF). Biological Bulletin. 205 (2): 102–109. doi:10.2307/1543231. JSTOR 1543231. PMID 14583508. Seibel, Brad A. (2001). "Vampyroteuthis infernalis". Archived from the original on 2005-12-24. Retrieved 2006-12-06. Young, Richard E. (June 2002). "Taxa Associated with the Family Vampyroteuthidae". Retrieved 2006-12-06. Stephens, P. R.; Young, J. Z. (2009). "The statocyst of Vampyroteuthis infernalis (Mollusca: Cephalopoda)". Journal of Zoology. 180 (4): 565–588. doi:10.1111/j.1469-7998.1976.tb04704.x. Hoving, H. J. T.; Robison, B. H. (2012). "Vampire squid: Detritivores in the oxygen minimum zone". Proceedings of the Royal Society B: Biological Sciences. 279 (1747): 4559–4567. doi:10.1098/rspb.2012.1357. PMC 3479720. PMID 23015627. Wikimedia Commons has media related to vampire squid. "CephBase: Vampire squid". Archived from the original on 2005.